Linger Longer Cottage is one of the original summer colony cottages at Baypoint, located on the western shore of Georgetown Island, in mid-coast Maine between Portland and Boothbay. Georgetown Island lies on the Atlantic Ocean where the Kennebec and Sheepscot Rivers meet the sea. Linger Longer was built in the 1890"s and recently updated for modern comfort, yet keeping the character of the cottage intact. The cottage has been owned by the same family since 1945 for their summer vacation retreats. Making Linger Longer your vacation home will bring you and your family right to the waters edge, viewing sunsets over Fort Popham, listening to the fog horn at Sequin Island Lighthouse and the crashing surf at Popham beach. 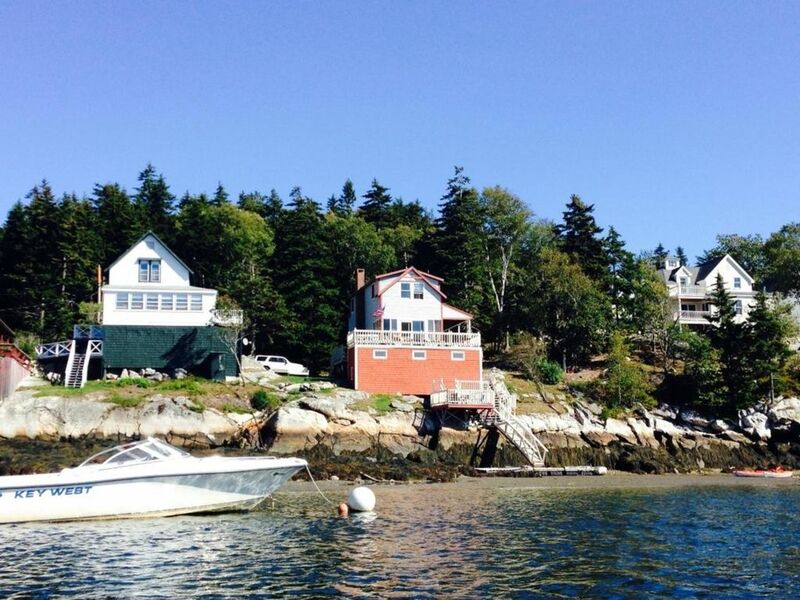 This gem of a Victorian cottage sits on a ledge at the mouth of the Kennebec River where it meets the Atlantic Ocean. Private beach within short walking distance, kayaking and biking (rentals nearby), swimming, clamming, (license available from town office), fishing, bird watching, local hiking trails, and unmatched ocean views. There are also several public boat launch ramps nearby. The Kennebec shipping channel, which can be viewed from Linger Longer, provides ever changing activity of boating including world class yachts, coastal cruising sailboats, fishing boats, tour boats, historical sloops, and Navy Vessels. And let's not forget the basking seals, the sea gulls, the bald eagles, the herons, the ospreys, and the terns, among many others, native to the coast of Maine. Linger Longer provides 4 small bedrooms upstairs with two full size and two twin size beds. The rooms are furnished with some of the original antiques that came with the cottage. Downstairs has a large living room with a daybed that opens up to a full size, two couches, two easy chairs, rockers, and dining nook with open views to water. There is also a closet filled with games for rainy days. Satellite TV and wi-fi internet are available. Updated bathroom with stall shower, vanity sink, and high toilet located at base of stairs. Dining room with large table for 6-8 and full updated kitchen with lots of cabinet and counter space, includes electric stove, refrigerator, and microwave. Plenty of dishes, cookware, and utensils for your family use including an outside gas grill. Lobster pot too! Supplemental electric wall heaters for colder days are located in living room, dining room, and bathroom. Access to the house is by stairs and/or a custom built ramp for those less able to climb stairs. Decks and porches surround the house. The Five Islands Wharf and Lobster Shack, Reid State Park, and Maine Maritime Museum in Bath, are a 20 minute ride. Grocery stores are within a 20 minute ride and a local country store is in the center of Georgetown a few miles down the road. Popham Beach and Fort Popham are a 45 minute ride. Freeport Outlets with famous L.L.Bean Outdoor Store are a 45 minute ride and Portland Jetport and restaurants are about an hour drive. Maximum two cars in off street parking spots. May be rented at nearby location. Golf facilities in nearby locations including Bath, Boothbay, Brunswick and Freeport. Wheelchair accessible to first level by outside entrance ramp. The bathroom is on first floor but not ADA compliant. Second floor is not accessible by wheelchair. However, there is a day bed on first floor in living room. There is a local private beach within short walk from cottage. Clamming flats and fishing available with seasonal license from town hall. This was a great place, exactly what we had in mind. The view is incredible, especially for sunsets. The place is big enough for 5 or 6 and the nearby beaches are perfect. We spent four wonderful nights at Linger Longer in late August. The cottage, dating from the 1890s, almost overhangs the rock ledge on which it is built. It's one of four similar homes from that era, in varying states of upgrading. The wood-paneled cottage is lovingly maintained and perfectly equipped for a family stay. Hosts Sharon and Ty were extremely welcoming and helpful but not intrusive. Everything you could imagine needing is available in the renovated kitchen. The best feature for us was the enormous living room lined with windows on three sides overlooking the gorgeous mouth of the Kennebec River, with Popham Beach right across the channel. The river is active with boating traffic and a sandbar within shouting distance -- a constantly changing scene. In good weather you can park yourselves on the small decks on either side of the cottage (the one with the green foundation in the pictures). The Bay Point area is at the tip of the Georgetown peninsula so there's no through traffic, a real plus. Extremely quiet, the road is great for biking for several hilly miles. About 20 minutes to the great Reid State Park and Five Islands Lobster Shack, and a bit more to Bath. Four small bedrooms upstairs were perfect for us (we are a couple and two grown sons). There's just one bathroom downstairs. But fully equipped with beach and bath towels. The home is not luxurious but thoroughly comfortable and ideal for a traditional Maine adventure. We will definitely return. Very relaxing with a beautiful view of Fort Pophom across the Bay.